Pop charts as we know them took many decades to arrive in New Zealand. The first record retailers in the Dominion were active at the beginning of the 20th Century, replying on imported stock (or, in a few cases records they pressed themselves offshore). If anyone kept a tally of sales or popularity statistics on these, they have been long been lost with time. 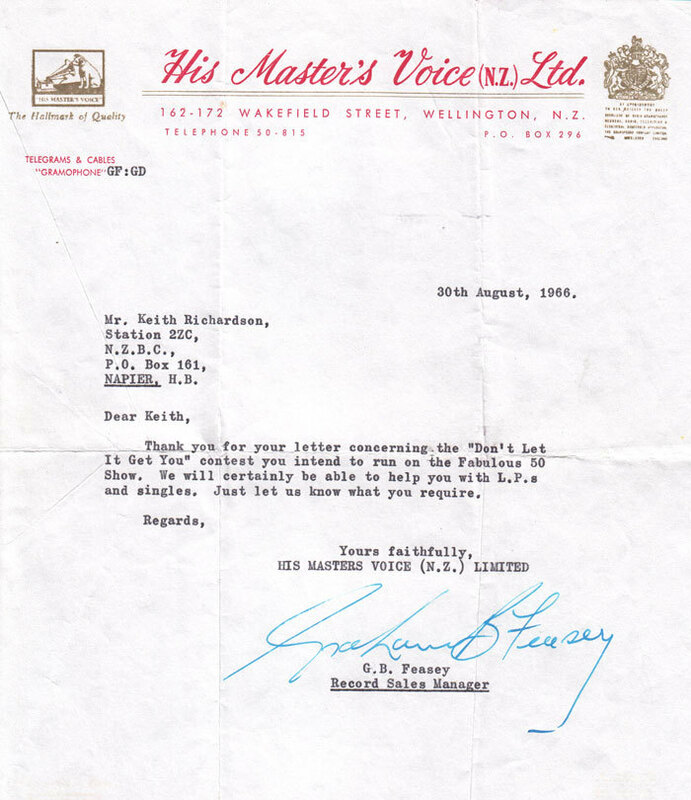 Between 1926 and 1948, most of the phonographic records in New Zealand were imported by His Masters Voice (NZ) Ltd., a division of the UK multinational EMI, and most were sold through their own home appliance stores and affiliated shops. There were a few small importers and attempts by the Dunedin based Begg’s chain to stand alone, but mostly HMV had close to a monopoly in both sales and distribution, often refusing to supply to stores that were not part of its own network. The first record pressed in New Zealand was made in 1948 by HMV at its new plant in Wellington. 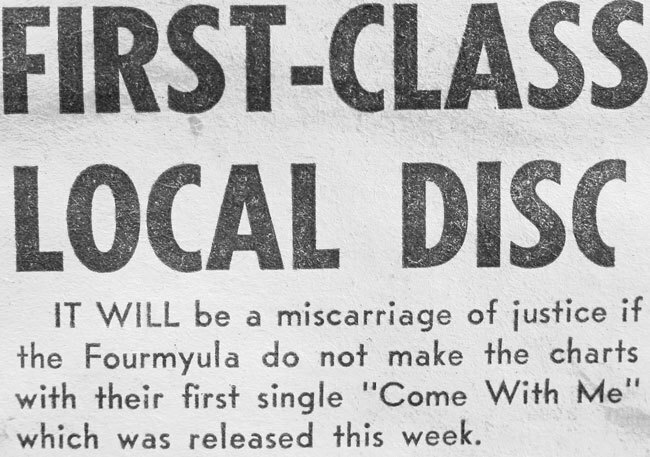 After the war other companies not only began to question HMV’s monopoly on selling the world’s record labels to New Zealanders, they also imported presses to make their own 78s (although the first LP was released in America in 1948, the new vinyl 45s and LPs would not to trickle into New Zealand until the early 1950s). The first record pressed in New Zealand was made in 1948 by HMV at its new plant in Wellington. It was the current American Columbia recording ‘Buttons and Bows’, sung by Dinah Shore. A few months later the locally owned Radio Corporation of New Zealand – manufacturers of Columbus radios – released the first song written by a New Zealander, and recorded and pressed in New Zealand: ‘Blue Smoke’. Written by Ruru Karaitiana, performed by his quintet, and sung by Pixie Williams, it was recorded in October 1948 and released in June 1949 on the new Tanza label. Despite sales charts appearing in the USA in 1940 and Britain in 1952, New Zealand and Australia preferred pop charts — indications of what was deemed to be popular rather than what was confirmed to be selling. In New Zealand a nationwide hit parade, compiled by advertising agency Lintas, informed the nation what they considered popular each Thursday night at 7pm on state owned ZB radio stations. The Hit Parade was first broadcast by the NZBC in September 1946, hosted by Rex Walden and produced by Sid Vause. The half-dozen discs were selected by the programme’s producer from recent releases. 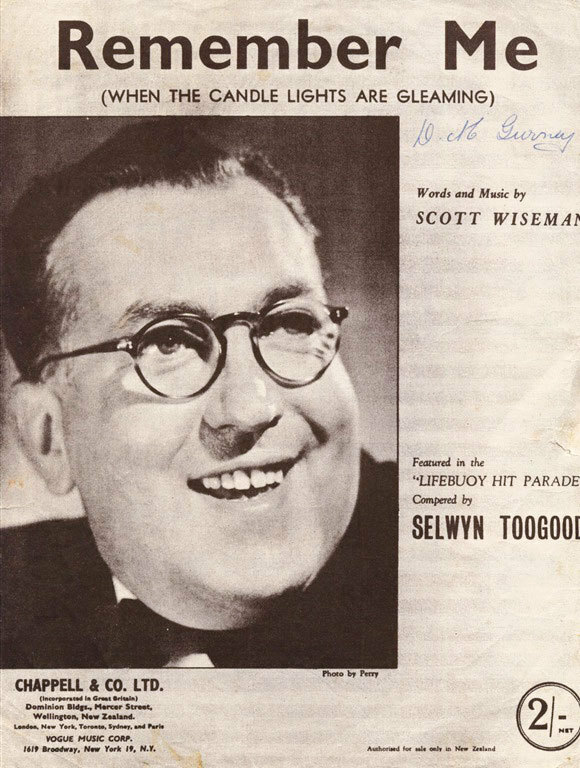 It soon became The Lifebuoy Hit Parade, with radio (and later TV) star Selwyn Toogood voicing the advertising. The show never pretended to be a sales chart. When Toogood joined Lintas in the early fifties he took over the weekly presentation. In 1955 the show was rebranded as The Lever Hit Parade. The Lever Hit Parade’s final broadcast was on 30 December 1965, with Ted Thorpe presenting, however it had long become an anachronism in a post rock and roll and beat world. A competition in 1952 to judge the most popular song of the year. The winner was Mocking Bird Hill, a massive seller that year from Mary Ford and Les Paul. In 1960 the new pop culture magazine Playdate launched, and featured a “New Zealand Sales Chart” for their first three issues. It is unknown exactly how and from what data this chart was compiled; Playdate replaced it with overseas charts after that. 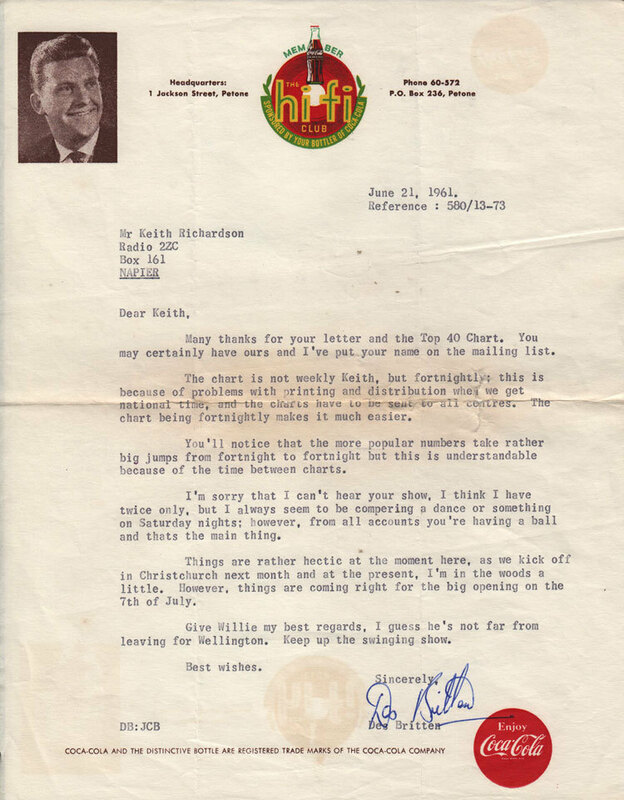 Coca-Cola then stepped in in the early 1960s with a fortnightly printed pop chart given a human face by Wellington radio DJ Des Britten, who also hosted a weekly show on the ZB network, and various live Coca-Cola Bottlers Club shows. Their charts were distributed through music shops and presented in an American Top 40 format with little pictures of Coca Cola bottles indicating a record that was headed for the top. Charts rarely featured hits by New Zealand artists until 1960. The informal charts favoured overseas artists because they were based on perceived popularity, not sales. A cultural cringe towards New Zealand acts also had an effect, with charts relying on votes. The "charts" were still a big thing even when there really was no such thing as a sales chart. The NZ Listener chart was regarded by fans and labels as important despite the way it was collated. It is only correct to say that 1950s acts “had a No.1” when referring to a regional radio station or newspaper chart: there was no national chart. 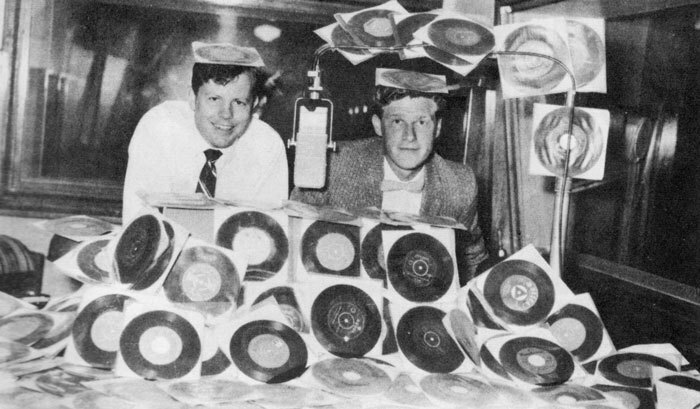 Johnny Devlin, Cole Wilson, Johnny Cooper and The Howard Morrison Quartet were some of New Zealand’s biggest selling artists in the 1950s but they were never “No.1”. While The Lever Hit Parade featured Johnny Cooper’s ‘Rock Around the Clock’ in 1955, it wasn’t until 1960 that the show began to regularly acknowledge local artists, amongst the earliest being Bill and Boyd, Eddie Howell, Toni Williams, Esme Stephens, and The Howard Morrison Quartet. 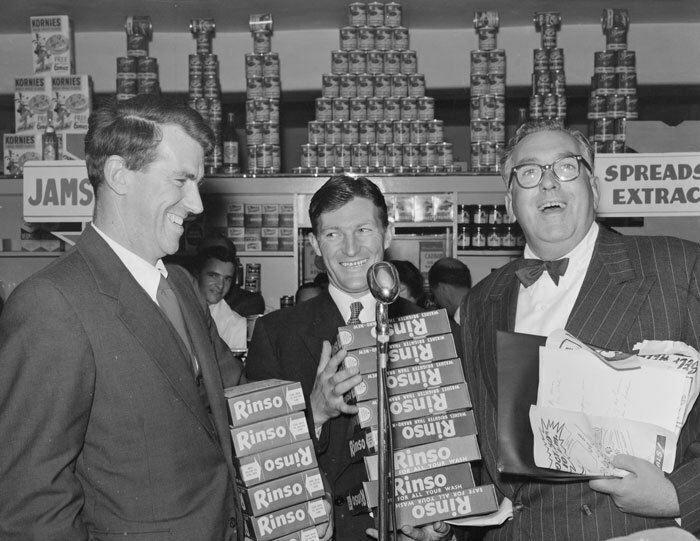 Sir Edmund Hillary in Wellington with Selwyn Toogood in 1956. As host of the Hit Parade, Toogood was employed by Lintas, not the NZBS. In Wellington, Auckland and Christchurch local radio announcers often played hit parades and countdowns based on their own preferences, and, indeed, radio station informal charts nationwide lasted into the 1980s. The New Zealand Broadcasting Service had a radio chart from 1957, initially a Top 7, but it seems to have been collated rather informally. Gather Round was originally hosted by Michael Woolf, then Paul Ricketts. In 1963 “Cham The Man” (radio DJ Neville Chamberlain) took over this chart. Gather Round was the first pop show to give The Lever Hit Parade any serious competition. In 1965 Peter Sinclair was also spinning the HMV Platter Rack. More of a pop trends and new releases show, than a chart show, it was broadcast nationally briefly. Roundabout was a mid-1960s Auckland based, nationwide, Top 40 show, hosted by Chris Parkinson, recorded at Astor Studios in Grafton Road. Sponsored by Helena Rubinstein makeup and The Chemists Guild, the responsible advertising agency renamed Parkinson as Christopher Day. 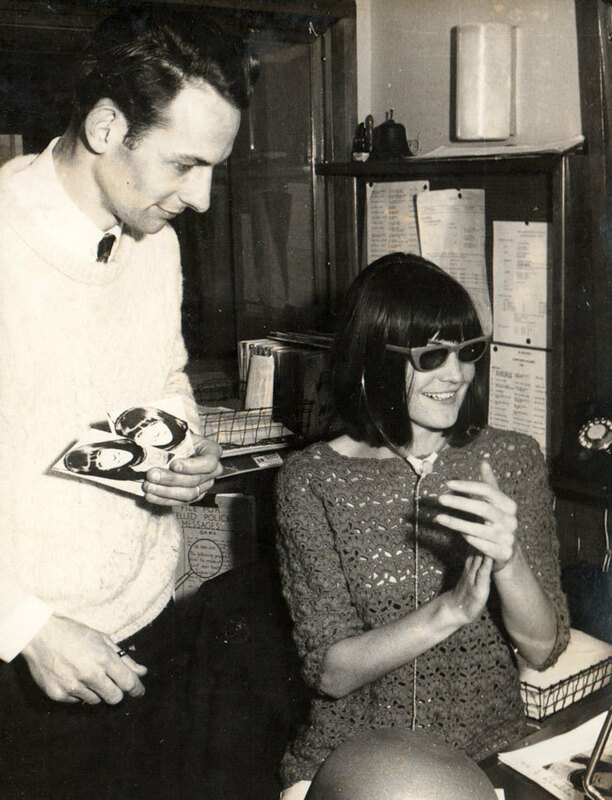 In 1966, as a result of Parkinson's ties to the new pirate, Radio Hauraki, he was replaced by Barry Simeon, who the agency renamed as Barry Knight. It seems to have ended when Simeon too, moved to Hauraki. Pete Sinclair taking a break. 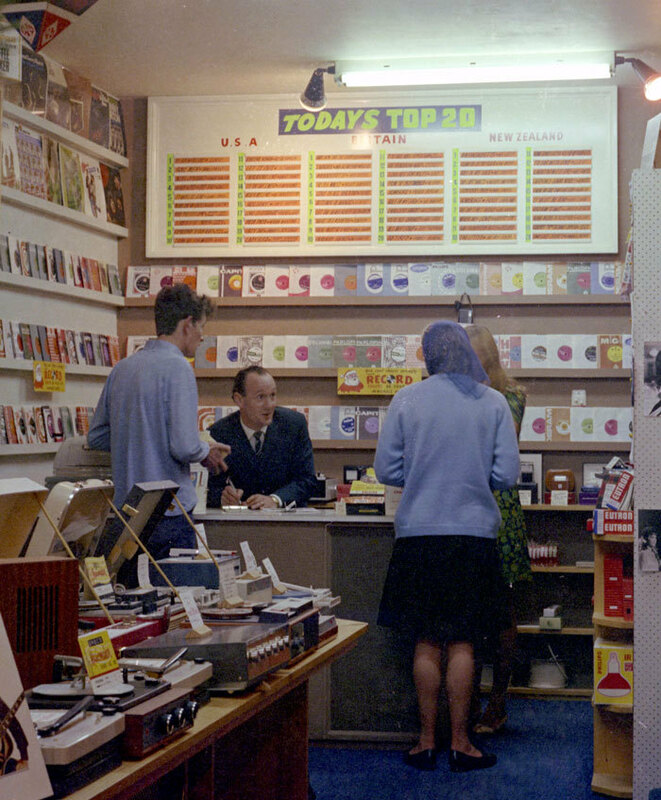 Sinclair was the host of the HMV Platter Rack in 1965 – it was, oddly, sponsored by a record company. He was the then the first host on the NZ Listener based chart show from early 1966 until later that year when Keith Richardson took over. 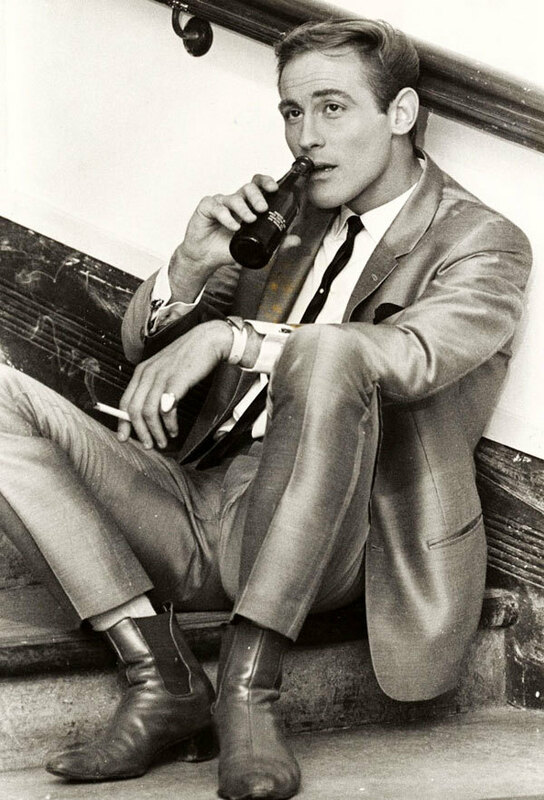 - Murray Cammick collection. From 25 March 1966 NZ Listener asked readers to vote popular tunes onto the magazine’s hit parade each week. Thus the NZ Listener’s chart, called the Pop-O-Meter from 1970, initially captured only the choices of those who bought the magazine and bothered to complete the coupon inside and post it in. This was hardly a reflection of the taste of the nation. 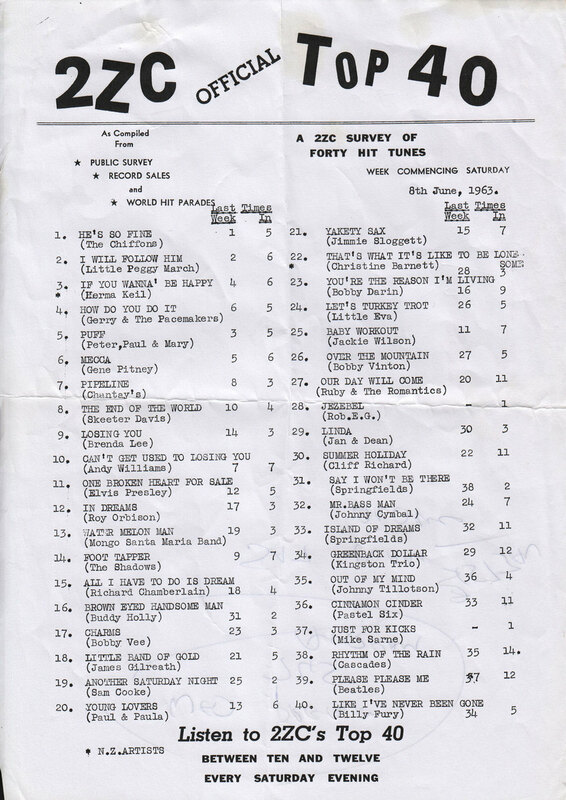 From September 1970 the Pop-O-Meter used impromptu sales data compiled by the radio stations. It seems not to have been scientific in any way but it was a quantum leap in accuracy. The chart shows were hosted until late 1966 by Pete Sinclair, intially as The Top Twenty and then as The Hit Parade. 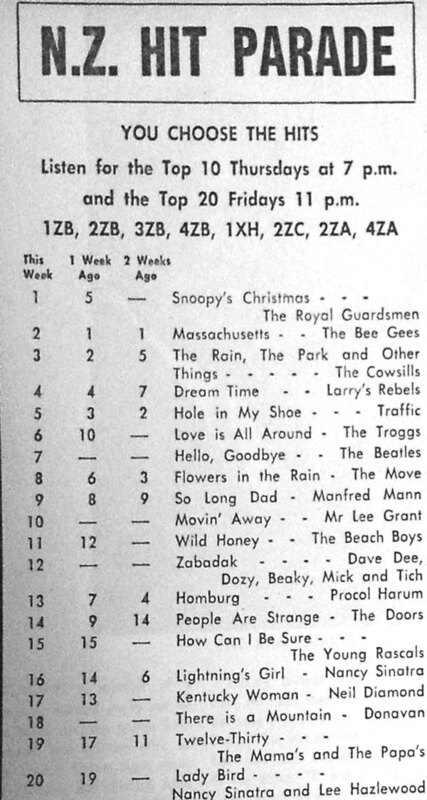 Perhaps the most important (and highly regarded) of the regional radio charts was the Saturday night 2ZC chart from Napier. Hosted by Neville Chamberlain, The Fabulous Fifty began as a Top 20 in 1960, and became a Top 40 in early 1961. 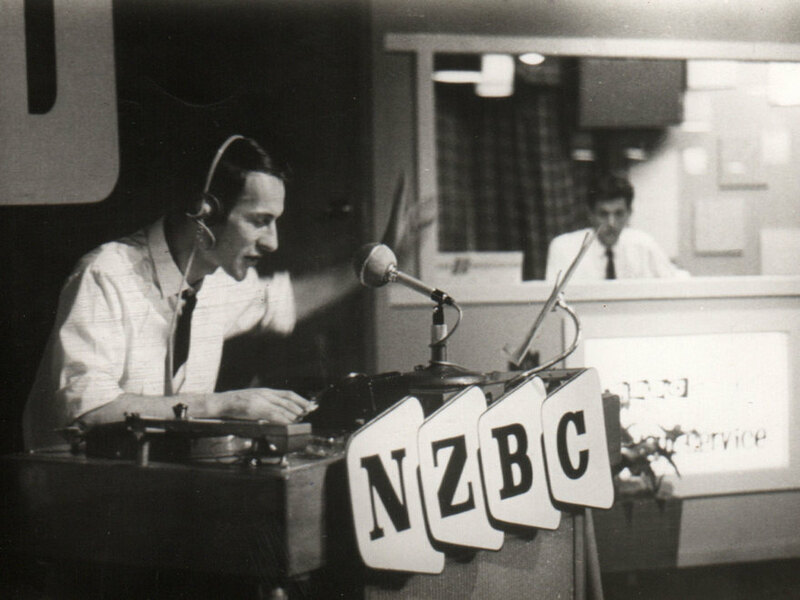 When he moved to Wellington in late 1961 Keith Richardson took over, and hosted the show until 1966. Early that year it was renamed The Fabulous Fifty. It featured a chart collated in Hawke’s Bay from a mix of airplay, hype and local sales. The show also from time to time had live sessions of local bands, recorded by engineer/producer David Lindsay. The transmitter seems to have been rejigged (somewhat suspiciously) to provide more power, and thus a nationwide presence, than was strictly allowed. A December 1967 chart from the NZ Listener, compiled by the readers' postal votes. There are two New Zealand releases in the Top 20: Mr. Lee Grant has entered at No.10. It would get to No.2, kept off by Snoopy's Christmas, a single widely regarded as the biggest selling 45 ever in New Zealand. Larry's Rebels are holding steady at No.4 with 'Dream Time'. In August 1966 Richardson was shifted to Wellington by the NZBC and began to broadcast the hit parade based on the NZ Listener votes, taking over from Pete Sinclair who was moved to the C'Mon TV show. The Top 10 was announced on Thursday, and appeared in the NZ Listener the next day, with the full Top 20 being broadcast that evening. Thus Keith Richardson was the voice (and later the face when his photo appeared next to it in the NZ Listener) of the charts until the early 1970s. The NZ Listener charts survived until 16 May 1975. 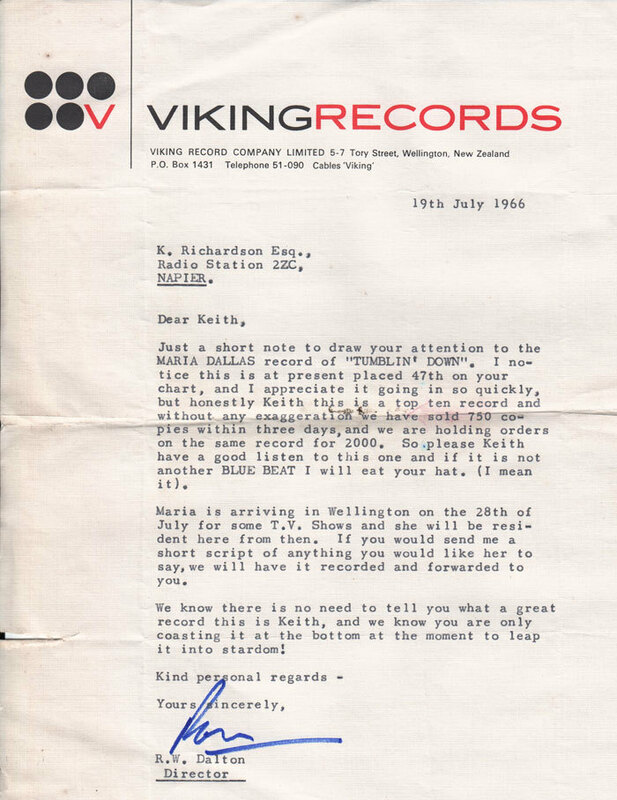 In 1973 Phonogram New Zealand boss John McCready suggested that a New Zealand chart of weekly record sales similar to those found in Britain and the USA was needed here. 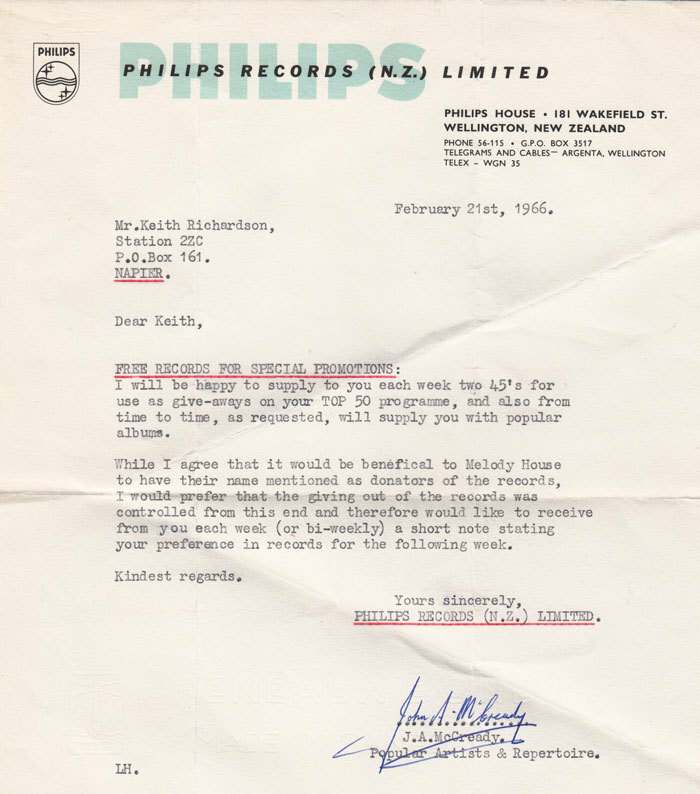 The suggestion was received coolly and only a couple of the New Zealand Phonographic Federation’s members bothered to send in returns. The Federation did put out a tender to manage statistics gathering, which was taken up by Heylen Research in early 1975. This was New Zealand’s first ratified sales chart - but instead of making it available to the press and public, the chart was at first deemed to be confidential information, available only to members of the phonographic industry. The recording industry board in the late 1970s. John McCready who first mooted the sales chart in 1973 is sitting on the centre-right with a striped tie. 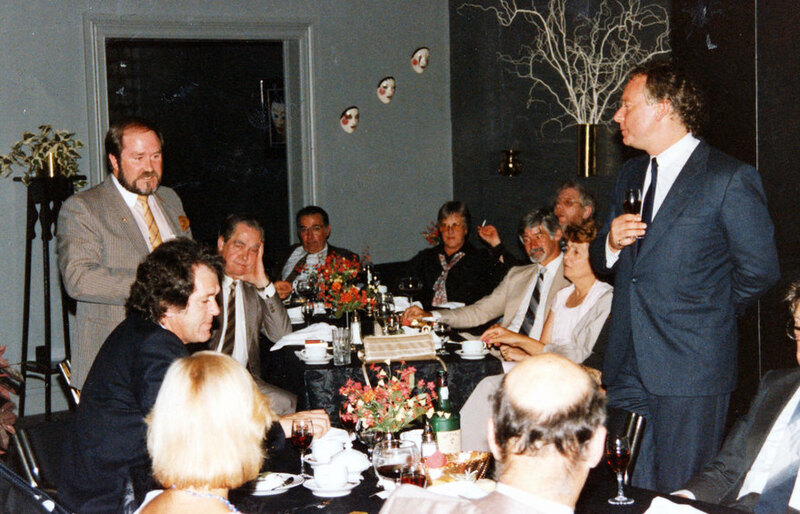 Standing on the left is Phil Warren, sitting next to him is Zodiac's Eldred Stebbing, and standing opposite is WEA's Tim Murdoch. It was the board of the New Zealand Phonographic Federation (later RIANZ) that put the mechanism in place to create the May 1975 chart. 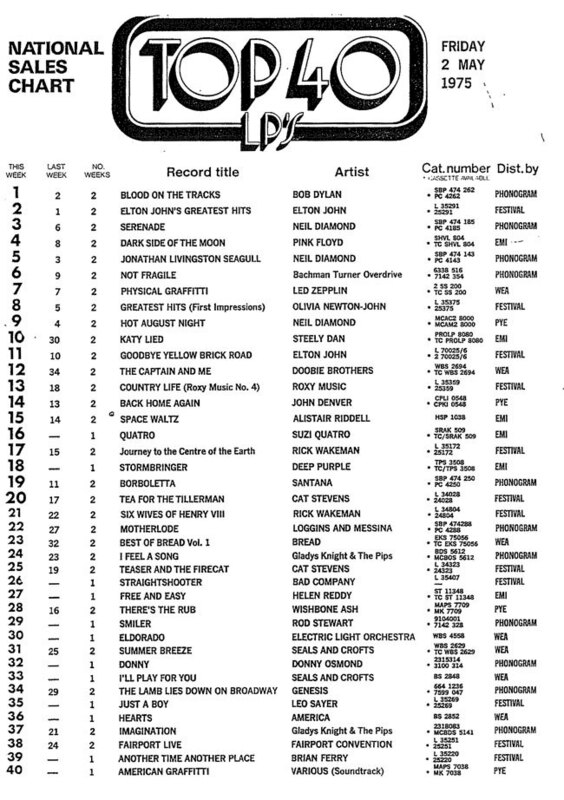 Shortly afterwards a board meeting agreed to make the weekly chart, a Top 40, available to press and public, with the first public chart being issued on 2 May 1975. The industry created a company, Record Publications Ltd., to oversee the charts in 1977, and expanded the chart to 50 places in 1979. The new chart, covering both singles and albums, was collated each week from “chart returns” sent in by 95 retailers; 80 of those were chosen randomly to represent the pool. The stores were weighted according to the country’s population with approximately 46% in the top of the North Island, 28% south of Hamilton and 26% representing the South Island. The retailers being surveyed were expected to write each day’s sales of a particular item on a list of releases submitted by the record companies. Space was left at the end for breakout records to be written in by hand. New Zealand had a sales chart. 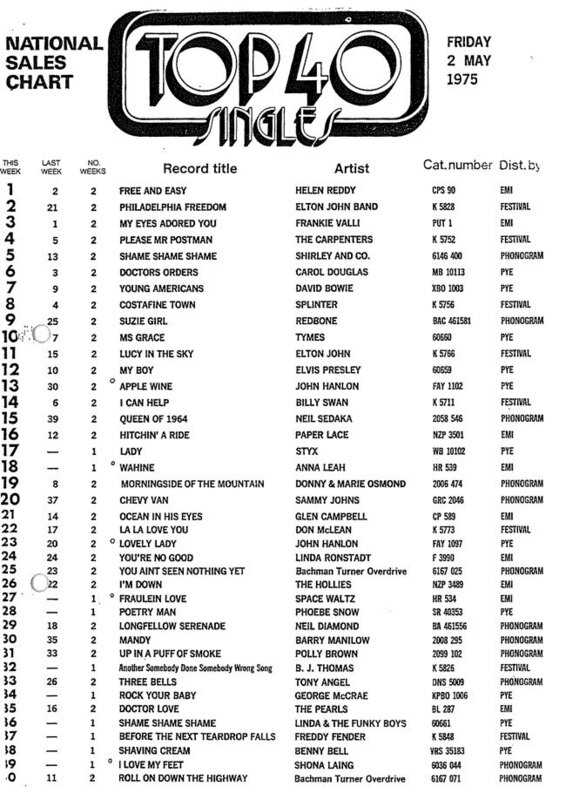 The very first national sales based Albums Chart, 2 May, 1975. The 2 weeks on some entries refer to an earlier trial week. All The Hits and more at Nga Taonga. Part two.